Well, I really wanted to post about this yesterday, but as is always the way with quilting, it took longer than I thought! That’s a lot of triangles! That’s a lot of pieces of fabric! It’s on point! Okay, so that’s enough drama. Guests could sign the blocks and I would sew them all up together into a quilt and that would be job done ™. But the colours I’d chosen to start with were too bright, and the brief became a dusky-pinks quilt, to match the theme of the wedding. 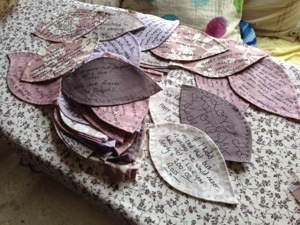 On the back of the quilt I would create a tree quilt, with leaves that were signed by the guests. 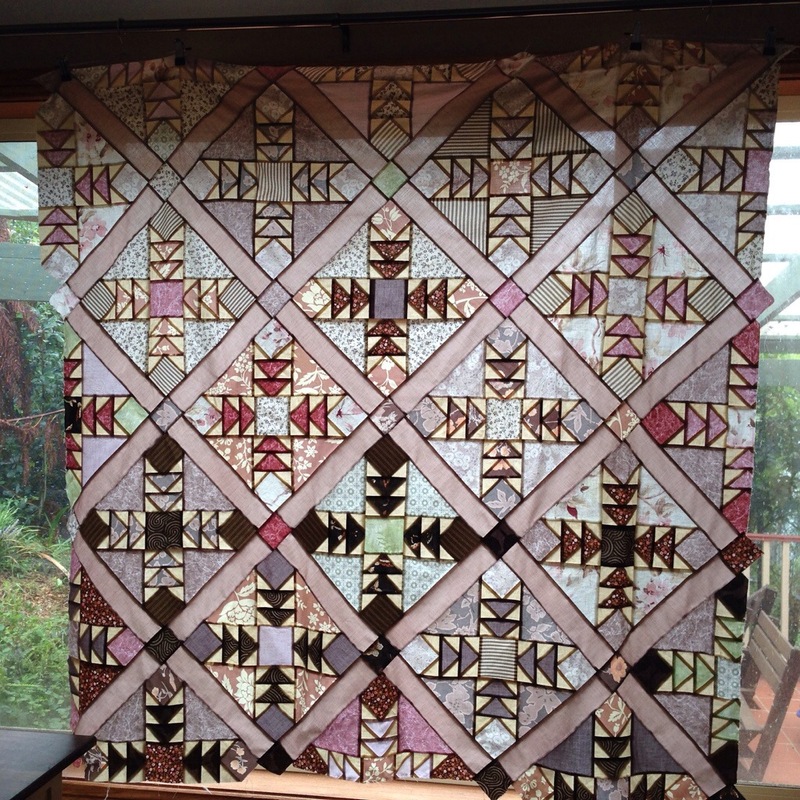 So, in effect, two quilts. Gulp. No worries, I had some time. 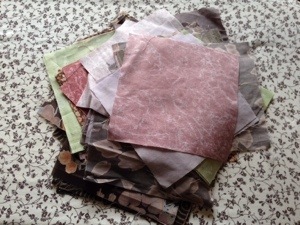 I began choosing fabrics that would fit into the “dusky pinks” category. Trickier than it sounds! I’m sure if I just spent several hours in the quilting fabric store this would have been easier, but small children and fabric stores do not mix. And I wanted to use recycled fabrics where I could. A few trips to the local thrift store netted me some stretch cotton stripy pants, a couple of floral blouses and skirts, and several usable pillow slips. I then took these off to the store to match some coordinating fabrics as best I could. I think I did pretty well, in the end! I then started cutting and cutting and cutting. And some more cutting! I cut waaaay too many squares, thinking I would need a lot more blocks. The pile you see above are the large squares I have left after piecing the quilt top. I also have the same of medium squares and quite a few small ones left! 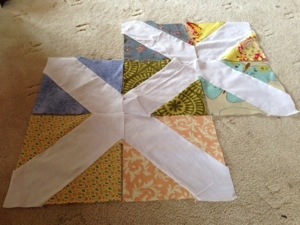 Never mind, they will still come in handy when I add a border to both the front and back quilt tops. I also made (I think!) about 70 appliqué leaves from a couple of templates I drew free-hand. Each one has interfacing and then a basic running-stitch edge to stop the leaf from ravelling when it was being written on and transported. That was quite a number of swimming lessons profitably spent! I think the other people at the pool thought I was some kind of crazy person with all these hand sewn leaves!